When I started this blog it was just for a creative outlet and my oh my I never expected so many great things to come out of it. To be featured in any publication is such an honor and I am still pinching myself over the things that have come my way by way of this blog. I am thrilled to have the blog featured in the May issue of Romantic Homes. I was contacted a few months ago by Beth Livesay to see if I would send in some photos for them to use for this issue. I was over the moon excited to see a full page of them used. Thank you, Beth and Romantic Homes. So glad to be included with other bloggers I know such as Kelly of Eclectically Vintage and Des of Peeking thru the Sunflowers. 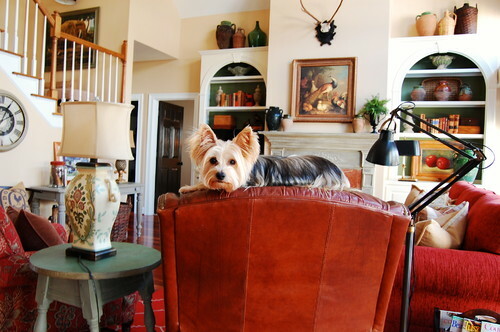 This morning I was looking at the latest Houzz newsletter in my email and there was Bailey's cute little face looking at me in a feature about dogs.They used one of the photos from the recent houzz tour of our home. Of course she may be getting the big head with all this publicity. I hope she doesn't start demanding things. You just never know what opportunities will come from this blogging venture. Oh, and I cleaned the garage today. Congratulations, Kim, on all your great press!! Great! Congratulations, you deserve it, Kim! Congrats!!! So fabulous to see you in print! Fabulous! I read about the latest spread from Diana! She gave you a very nice shout out. Bailey is adorable and will probably demand his own blog. What FUN, Kim ... another well-deserved feature, indeed! I'm sure Bailey is loving the spotlight, too! Your home is beautiful and I continually admire the pictures you share in your blog. Congratulations being featured in Romantic Homes. Congratulations Kim, very exciting news!! It was so fun seeing you in Romantic Homes, Kim! It really is a fun adventure! Congratulations! Bailey looks adorable. I'm clicking over to see the Houzz issue on dogs. Our garage could use a good clean out and reorganization. Are you available? Congratulations, great blog and adorable dog! Congrats Kim...when I see these in the magazines, I always tell my husband...that is one of MY bloggers!! Congrats Kim! I'm sure Bailey is loving all the attention! Absolutely amazing, Kim, and so well deserved! Congrats! Congratulations, Kim. That is fantastic!! Oh how sweet is that that Bailey gets to be famous also. Can I have Bailey's autograph? I am so happy for you! I wonder if Charles Faudree knows he has competition? It really was a great feature, Kim. Great photos too! Congratulations Kim; you deserve it! I'm a long time reader of your blog and absolutely love everything in your home including Bailey and the projects you do are such an inspiration to others. Congrats again! I know this is something you've wanted for a long time now and it just shows that good things come to those who wait. You'll have to get Bailey an agent now after this! LOL! Congrats girl, twice in one day!! Very well deserved Kim, congrats girl!! Bailey has a star like pose, too cute, lol.. I am so happy to know you Kim and your wonderful Savvy Southern Style..very inspiring..thank you. Congratulations, Kim. The pictures look gorgeous. Congratulations Kim! Your house is so beautiful but you are truly talented at using the camera to show us that. Great way to start your week! That is so awesome!! The pictures are really good too, great angles. I would be interested in knowing if this brings a flood of new followers. Kim... you are as sweet as you are talented. Couldn't be happier for your success. And Bailey's too!! You deserve every article. Your home is lovely and real. So happy for you Kim! Cutest pup ever!!! Kim, On vacation I picked up May's issue and I was so thrilled to see your beautiful home. Even before I looked at the article, I knew that they had featured you by your stunning pictures!!! So so happy for you!!!! Congrats and Kudos! Kim & Bailey - Congratulations on being published. I think Bailey needs a diamond collar at least, don't you? Congratulations, Kim! I am always surprised and so happy to be published. Keep up the gorgeous work! Love that pic of Bailey. I'd love to hear more of Bailey and his breed. Congratulations Hon, what a thrill I am sure! A well deserved full page feature Kim!...and they should see your new dining room now! !...and that Bailey is the cutest dog in blogland...and talk about "texture" referring to your post at StoneGable...Bailey adds the perfect "natural texture" to all of your rooms! !...She is the best!...Congrats again on the Romantic Homes feature...I know you will be bound to have more features in the future!! Congratulations on the Romantic Homes feature. I saw the May issue this week and was so excited to see your blog highlighted. Yeah Kim!!!! Who knew just a few short years ago when we were on RMS that so many great things were coming your way! I am so proud of you and so happy for you! Congratulations!! Your house is gorgeous and Bailey...Well Bailey's a star!! Oh Kim, I am over the moon happy for you!! You are too big to be cleaning the garage now!! Get that husband of yours to do it. Outstanding! Congratulations to you and Bailey. Bailey deserves the attention...and SO DO YOU! Congratulations! Your house is beautiful, and it SHOULD be in a magazine! Congratulations, they are lucky to have your home in the magazine. I'm so happy for you, Kim! A well deserved honor. I am so happy for you! I can't wait to pick up the issue so I can get a closer look at your beautiful feature! Awesome, Kim! Congratulations! I remember when I had my first painting in the State Museum. I got a call from our state senator's wife asking if they could borrow the painting for the senator's office for a year. The senator also had an artist's reception and it was the night before the senate voted for Nafta. The reception was loaded with senator's and congressmen wanting to change our senator's mind (he was voting against). Our local paper even sent a reporter to Washington D.C. for the event!!! It was great! I am so excited for you and Bailey, and I can't wait to find a copy of the magazine! Congratulations! Big congrats, Kim! I know you are thrilled, enjoy it all. Cograts Kim!!! Very exciting for you and Bailey. Good for you! YAY! So happy for you - you definitely deserve it! How exciting, Congrats and high 5!!! Oh, Kimmie! I'm so proud for you. That is just thrilling to have been featured and they certainly chose the person with the most beautiful home that shows off her talent! :) You're most famous now and I love the little snap of Bailey on the back of the chair. Well I tell 'ya... my magazine consumption has gone up with blogging. Every time I find out a blogger is featured in one I don't subscribe too, I pick it up at the store so as I read at night I can hit my husband as he sleeps and say "I know her!". Amazing!!! How did I miss this??!! Well deserved Kim. Good on you!! Luv the picture of Bailey!! Not a bit surprise of your RH feature, you totally deserve it! I love your style! I just got my copy today and was thrilled to see us featured together! Your page is gorgeous!! Congrats - and don't let it go to Bailey's head! Congrats Kim! That's so awesome! SO well deserved - your home is lovely! Congratulations Kim! It is your creativity and sense of style (and hard work) that makes your home so beautiful. Bailey is so cute! Congratulations! I'm thrilled for you!!! Congrats... I have discovered many a great blog through the features in Romantic Homes. As a blogger I could only dream of being featured... but alas my photos just would never measure up... I am good writer and a lousy photog *giggle*... so envious, but in a good way. Again Congrats! I was tickled pink to see you,Des and Kelly featured!! So well deserved! Congratulations Kim!! I'm so happy for you! I hope you see this because I'm late in commenting. No one deserves a magazine feature more than you. You have worked so hard to make your blog what it is. You support other bloggers too by hosting your linky party and your Friday features. Congratulation!! Congratulations Kim and I must say that Romantic magazine has extremely good taste! Kim!!!! That is over-the-moon fantastic. I have gotta get to B&N and pick up a copy so I can see it for real. Happy for both you and Kelly. Love the picture of sweet Bailey. That little face gets me every time. Congrats, Kim. I echo everyone else...well deserved. I'll have to pick up a copy of RH. Bailey may end up being a movie star! Too cute. Oh wow Kim!!! Congrats! It couldn't have happened to anyone better! Sweet! That is one of my favorite magazines. I am so not surprised though. my friend! Mark my words! 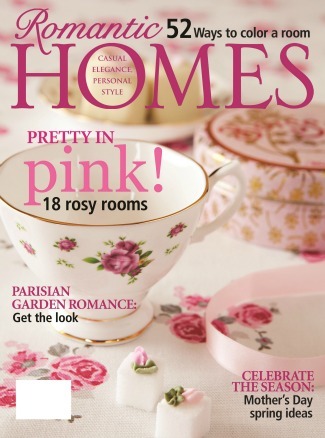 Hi Kim, congratulations on the Romantic Homes feature, that is very exciting! If it is a magazine you buy regularly, would you mind letting me know if you spot any mention of me in there?